Looking to go paperless? 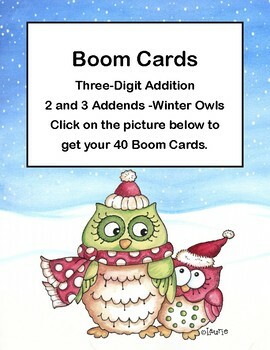 These digital Boom Cards are just what you're looking for. This collection of 40 cards offers plenty of practice in adding 3-digit math problems. Included 20 cards of 3-Digits by 2 Addends and 20 Pages of 3-Digits by 3 Addends. Since they are Boom Cards, they are self-checking. Immediate reinforcement for your students and smaller paper piles for you! When you download the product you will find the link directions and be able to access and play right away-no prep for sure. Great way to lessen paper piles. Boom Cards live in the cloud. They can't be printed. They play on most modern browsers, Android, iPads, iPhones, and Kindle Fires. You open a Boom Learning account to play them (to protect the children). Create Fast Play pins to assign your Boom Cards to students. Looking for more math ideas?